Happy Nails embodies the story of one family searching for the American dream. As they did so, they managed to found a brand that embodies small town charm with all the luxury of a well-known and prosperous brand. With great service, an amazing ambiance and budget-friendly prices, you can find much to love at this California-area nail salon as well. Happy Nails prices start at $15 for a basic manicure and go up from there. Happy Nails is the clear choice if you are looking for outstanding nail and skin care in Southern California. While each salon offers a slightly different look and size, each has a luxurious feel with leather-looking massage chairs and glossy, marble-like surfaces. As soon as you step in the doors, you will feel as if you are in a place where you can be pampered. With luxurious, full-service options and such a beautiful and relaxing environment, you may expect the price list to reflect this elegance. However, the prices remain easily affordable even if you are living within a budget or trying to cut back on some costs. The owners of Happy Nails have made it their priority to keep their salons high in quality and service but low in cost. To make an appointment, simply call your local Happy Nails location. Although appointments are not currently taken online, you may be able to get in during the convenient daytime or evening hours as a walk-in guest. However, for the fastest service or to see your favorite provider or receive specialty care, be sure to call ahead to set up the best time for you. Happy Nails offers a wide range of services for skin and nails. Although they bill themselves mainly as nail salons, Happy Nails locations provide multi-faceted services to get you looking and feeling your best whether you are prepping for a week of work or are getting ready for a special occasion. You can get an acne treatment or back purifying treatment to take care of clogged pores. The salons also offer three types of facials, including the Deluxe European Facial, which comes with a hand and foot massage. If you want to get rid of a bit of extra hair, consider their amazing waxing services for face and body. Smooth your brows or chin, or try a full-leg or half-leg wax to step away from your constant shaving. You can also try a bikini wax or Brazilian wax as you prep for swimsuit season. However, the most popular services here by far are the Pamper Me Manis and Pedis. These are full-service manicures and pedicures that let you relax while enjoying beautiful nails. To save even more, consider the Simply, Please Me or Indulge Me options instead. Melt away the tension from your tired hands with a hydrating massage and hand mask, polished off with the color of your choice. Reward yourself with this manicure for any occasion. Special shape or longer shape. Relax while your feet are soaked in a warm whirlpool bath and your nails and cuticles trimmed and buffed. Your feet will be exfoliated and massaged, then finished off with a polish of your choice. Indulge while we tender to your cuticles and shape your nails followed by a polish. Rest your feet while we make them look fantastic and sandal ready. Treat yourself and feel great with our Simply Pedi. Rejuvenate your skin while enjoying a peaceful and clean atmosphere. Our professional aestheticians will provide you with a complimentary consultation and custom facials tailored to your skin type needs. Improve your skin tone with our AHA (Alpha Hydroxy Acid) treatments. This formula works to clear up and prevent acne infections. Herbal botanicals are used to sooth irritation and break up oil within your pores. Our back purifier treatment includes deep cleansing, peeling, extraction, masque and massage. Our technique will relieve and prevent breakouts and leave your skin felling clean. Refresh your skin with a deep pore cleansing, steam treatment, masque and massage. Unwind from a long day with a European facial that includes exfoliation, extraction, deep pore cleansing with steam treatment, masque and massage. Disclaimer: Prices above are for estimate only. The data has been gathered from various sources (online, on-site, and/or via phone). Pricing may vary from one location to another of the same salon brand or may not be current. To confirm current pricing, please contact your local salon. Disclaimer: Hours of operation may vary slightly from one location to the next. To confirm current hours, please contact your local salon. Being known more for their full-service appointments, Happy Nails does not sell many products. However, you may want to consider their gift cards that come in four different amounts. These make great gifts for friends and family and are perfect for birthdays, anniversaries or even bachelorette gifts. Happy Nails began in 1983 by a Vietnamese couple who were searching for the American dream after recently immigrating from Saigon. Mai Huynh had been providing manicures and related services in Vietnam before coming to the United States, and she decided to put her skills to work here. However, it was with much work and determination that she and her husband learned how to create an ideal and prosperous business in the U.S. They obviously learned the right way to do it because Happy Nails has become a great hit in Southern California where its 50 locations are situated. 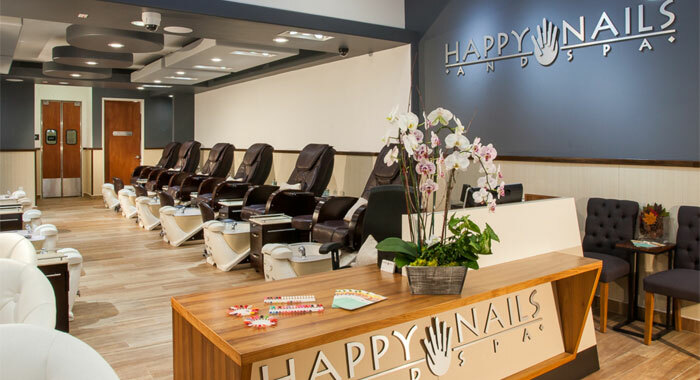 Mai and Henry Huynh named their salons Happy Nails because they wanted the emphasis to be on happy locations where clients could unwind while being pampered. Their attention to these seemingly minor details has helped them earn quite a following in San Diego and Los Angeles, and the brand is sure to continue growing. Note: All pricing provided on this website are estimates only. For current pricing in your area, please contact your local salon. © 2019 SalonRates.com. All rights reserved.